IT IS TAKE two for the biggest fight in world boxing this weekend when the long-awaited rematch between Saul Alvarez and Gennady Golovkin lands in Las Vegas at the T-Mobile Arena. The pair created a very special event a year ago at the same venue and it was such a shame that such a sizzling occasion that lived up to its billing was diminished by, to put it kindly, erratic scoring by two of the judges. It did the sport no favours – through no fault of the fighters – and the two offending officials will be nowhere to be seen this time around. The narrative of this fight should be a fired up Canelo seeking retribution for a pretty decisive points defeat, in my book. Instead, the storyline is a wronged Golovkin bidding to put right an injustice. In more ways than one. Canelo being banned for six months and the subsequent cancellation of the proposed May 5 date has increased the ire of the usually placid Golovkin, who elected to fight his corner with his pay demands for this delayed rematch. The token slap on the wrist handed down to the Mexican will not have affected him greatly because he only fights twice a year anyway these days and it will be interesting to see the tactical tweaks he will bring into the play this time. If Canelo fights like he did last time there is no way he is going to win backing off him all the time. So is he going to go on the front foot and go toe-to-toe? If he does do that, even though he is a very good fighter, I don’t know if he has got it in him to match Golovkin punch for punch. I don’t think he does and you can’t get away from the fact that Canelo was found guilty of a doping violation. We simply don’t know if he will be the same fighter without illegal assistance and how it will affect him. There are a lot of unanswered questions where Canelo is concerned, while Golovkin is more of an open book. He has only really had one off night or below par performance in recent years and that came against Daniel Jacobs – a fight that probably gave Canelo the confidence to step up to the plate and tackle the threat of the fearsome Kazakh. Outside of that fight he has been consistent in what he does all along. Whatever way you want to look at it, Canelo is the biggest name out of all of them as demonstrated by the pay-per-view numbers. You’ve got the biggest two out there and, as much as I think Vasyl Lomachenko is the best fighter out of all them, as far as Canelo is concerned he is the biggest PPV attraction in world boxing. Unfortunately for him, this won’t help him on the night. To beat Golovkin you’ve got to have a very, very, very good boxing brain and have also got to be very elusive. It would be a real tough one for Billy Joe Saunders, but that is the style of fighter who I think will prevail over him. Canelo does not possess those attributes. He is a good boxer and an exciting one, but I don’t think he has got the boxing skills to really trouble Golovkin. I don’t see a deterioration in Golovkin at the age of 36 as he looked absolutely fine last time out when the vast majority of observers thought he won it clearly – including the Mexican fans who voiced their displeasure at the scoring. 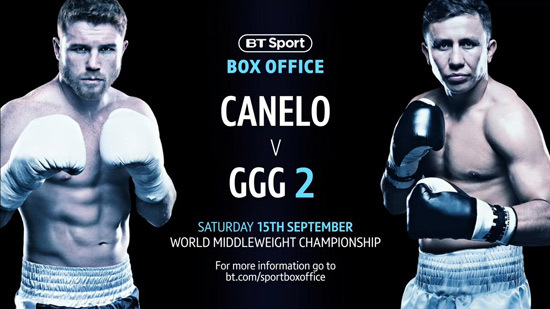 This mammoth collision of two modern greats is a fitting launchpad for the advent of BT’s Box Office channel, which will also provide us with a massive boost in the marketplace to deliver the big fights when they are there to be made.